A disturbing account in the Guardian of abuses of archival records within the museum world (“Tate’s national photographic archive ‘rescued from a skip’ after internal tipoff”, 24 February 2012 ) disclosed how the Paul Mellon Centre for Studies in British Art, received a call from a Tate employee who said “you might like the curatorial photo archive because we’re about to throw it on to a skip” (- or, in American usage, throw it into a dumpster). 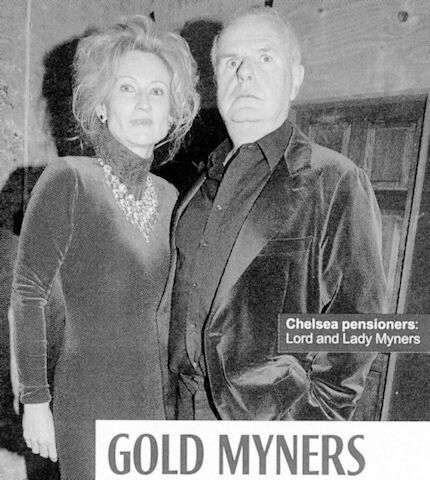 Shocking as this report was, it came as no surprise to us because in recent years the Tate has shown a notoriously cavalier way with its artistic holdings and its archival material (see right). More surprising was the Guardian’s revelation that an archive of black and white photographs of almost every item held at the Victoria and Albert Museum and grouped by subject, had also been dumped by the curator in charge. This dual elimination of black and white photographs echoes the destruction of old black and white television programmes that routinely took place at the BBC until 1978. A further destruction of archival property within British cultural bodies in recent years included that of newspaper collections held by the British Library. Sometimes a justification offered for archival vandalism is that essential “content” has been preserved by transfer to other media. The speciousness of such claims and the frequent destructiveness of such practices were searingly established in Nicholson Baker’s 2001 book “Double Fold: Libraries and the Assault on Paper”. Following our reported comments in the Guardian article, we received a note of sympathy and an invitation to read the “Florence Declaration” from the director of the Photographic Library of the Kunsthistorisches Institut Florenz (the Max-Plank Institut), Costanza Caraffa. We are indebted: it seems that there is a wider threat to photo archives. The Florence Declaration is a call for the integration within photo archives and libraries of photographs in both analogue format and digital format. Their dual preservation is rightly taken as being essential to preserve the photographic heritage for future studies. For our own rather specialised primary purposes the value of photographs lies not so much in their individual intrinsic qualities, as in their relationships to other, earlier or later photographs. The accumulated sequences of images (of paintings, drawings, prints, architecture, sculpture, metalwork, illuminated manuscripts, stained glass, wall paintings and textiles) held in the Courtauld Institute’s Witt and Conway photo libraries, and the photographs of paintings held in the National Gallery’s curatorial and conservation dossiers, greatly facilitate the identification and demonstration of injuries to works of art through restoration “treatments” (see right, Fig. 4). The great value of photographic collections is, however, multifarious not singular. For some researchers, the self-same images might assist in making specific attributions of authorship, or in establishing chronological relationships within an oeuvre or period. For others still, the images can inform more general scholarly, thematic, historical, artistic or even sociological studies. In truth, all such focussed collections facilitate and trigger infinite lines of inquiry and speculation – and their benefits can neither be quantified nor anticipated in advance. Digitalised versions of photo collections – immensely useful as they are – cannot replicate or replace the ultimate benefits of “hands-on” studies of hard copy photographs, each of which is a physically and historically unique record made at a certain time, in a particular way, of a certain object, under a particular lighting condition. The ability to compare, juxtapose and read such various, culturally-expressive living historical records, in real space and real light, one against another, freely and without the physical and visual fatigue that attends a prolonged relationship with a fixed electronic screen (see right), is a methodological luxury and necessity. A photograph is a thing; a digital version is a virtual simulacrum of a thing. Although it is technically possible to track every manipulation of a digital photograph’s raw data, in practice, a photograph-as-object is more trustworthy, carries its traits and its history about its person, as it were. A most moving evocation of the multiplicity of uses within hard-copy photo collections – and of their great vulnerability in a philistine, cost-cutting world – was brilliantly captured by Stephen Poliakoff in his 1999 award-winning television drama, “Shooting the Past”. We have long suspected that the inescapably destructive impulse of restorers constantly to undo and redo the material fabric and the artistic character of works of art through restoration/conservation “treatments” is a manifestation of a wider, history-hating cultural pathology; a narcissistic and hubristic desire of succeeding generations to remake history in their own image rather than to learn from it. 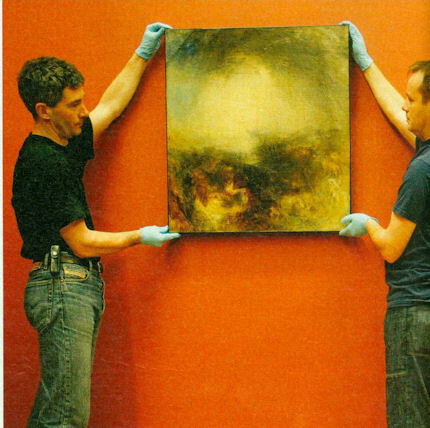 The evidently assumed similar right of curators to undo and discard the historic record itself – even when held it is held in public trust by supposedly dedicated, culturally and fiscally privileged institutions like the Tate and the Victorian and Albert Museum – and even though that record possesses the power to hold to account as well as to illuminate, is a dangerous new, hitherto unimaginable, cultural low. Above, Fig. 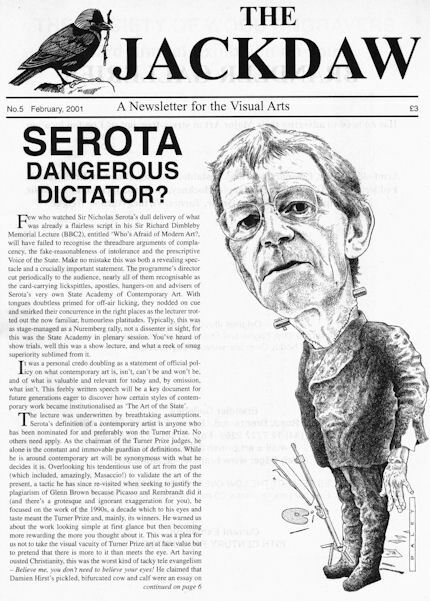 2: The Tate’s director since 1988, Sir Nicholas Serota, as shown in the Jackdaw No 5, February 2001 (“Serota Dangerous Dictator?”), when he had been in place for thirteen years. When Cornelia Parker asked to use lining canvases removed from Turner paintings at the Tate for an exhibition of her own work, conservators at the gallery protested against the misuse of technical archival material. 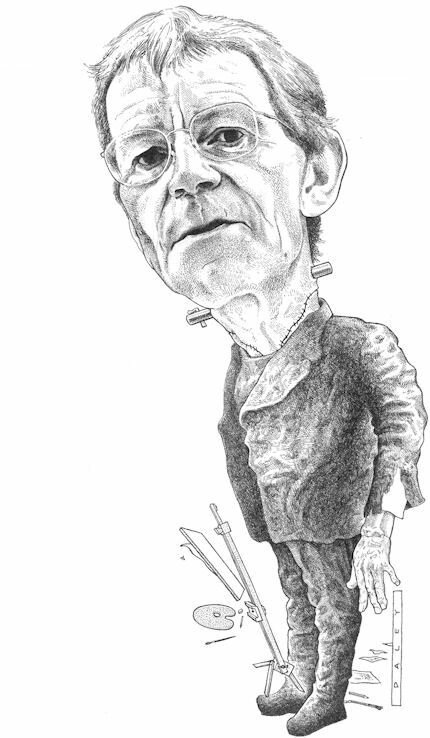 They were over-ruled by Serota. 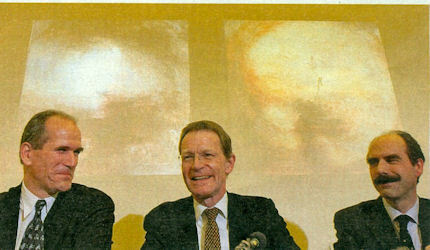 When a small municipal German gallery that shared premises with a music college and had no perimeter defences, requested the loan of two important Turner paintings, Serota agreed to lend, instructing the German gallery to collect the paintings from the airport as they would not be being courrier-ed by the Tate. 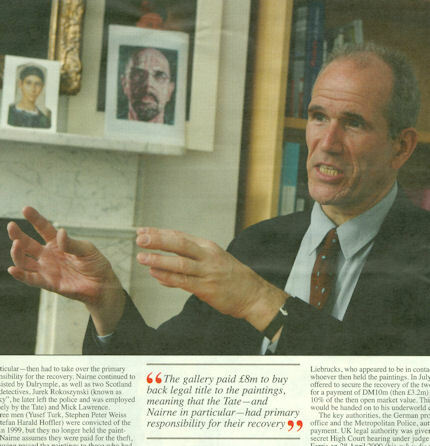 When the paintings were susequently stolen by Serbian gangsters, the Tate paid a £3.1m ransom. 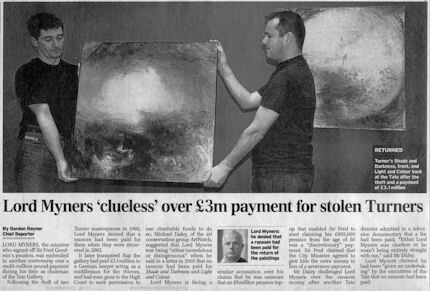 It could easily afford to do so because, earlier, with the intervention of a Government Treasury minister, the Paymaster General, Sir Geoffrey Robinson, the Tate had shaken a £22m windfall out of the insurance underwriters of the stolen Turners. The money had been urgently needed, Robinson said, to complete Tate Modern. 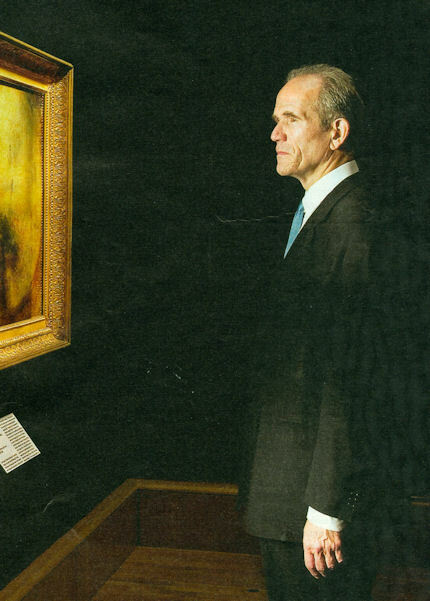 Serota is reported in the March 2012 The Art Newspaper to have defended the decision to shed two highly respected curators who are specialists in British art of the 16th-19th centuries. This is not a cost-cutting exercise, a Tate spokeswoman has said, but an attempt to bring new blood and younger curators into the Gallery. Even though the modern collection was moved out of the Tate Gallery on the completion of Tate Modern, the entire pre-19th century part of the British collection remains effectively confined to a single room. Above, Fig. 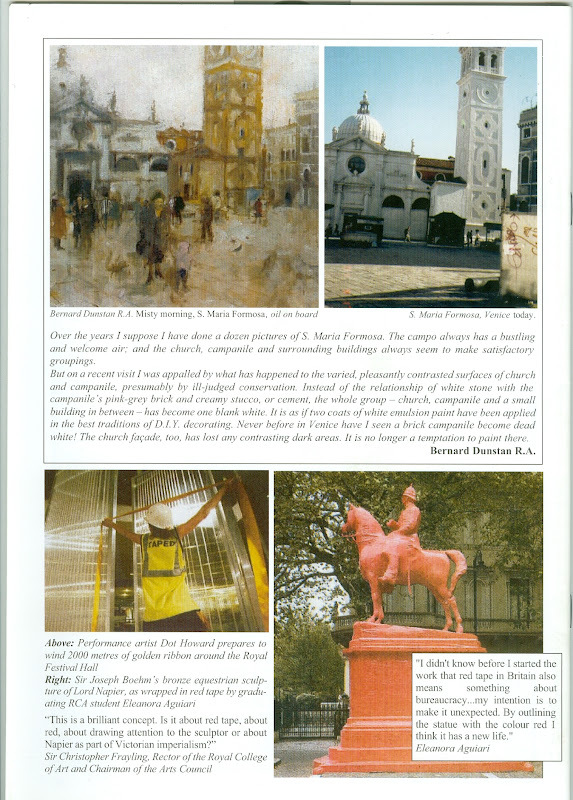 3: the back cover of ArtWatch UK Journal 20. Above, Fig. 4: Two photographs (by courtesy of the National Gallery) showing details of the Rubens school The Triumph of Silenus. 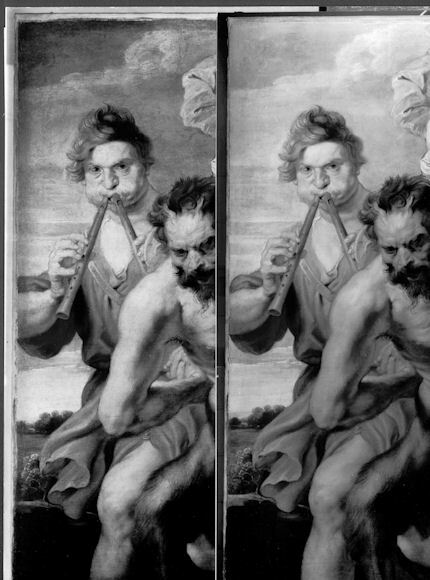 The left photograph records a pre-cleaning state, the overlapping, right photograph shows the post-cleaning state. Because the pronounced and various changes of value that can be seen within the two photographs cannot be accounted for in terms of differences of photography and processing, it must be concluded that they arise from the intervening restoration. Below, Fig. 5: The Photographic Library of the Kunsthistorisches Institut Florenz (the Max-Plank Institut).